Because most socks are designed for a range of sizes, people with larger feet tend to struggle with socks that are too small. You will find that these socks will fit your foot and stay up and not sag. These Callaway Performance socks were designed specifically for golfers. The material: 75% cotton, 22% nylon, 1% polyester, and 2% spandex. The socks are light and thin and wick moisture away from your foot. The top cuff is ribbed for added durability and protection from rubbing on those stiff golf shoes, and the socks have a half-cushion design for added comfort. Finally, they have a snazzy "Chevron" logo on each side of the cuff. If designer socks with logos aren't your style, I would recommend you checking out these Men's Nike Dri-Fit No Show socks. These use Nike's patented Dri-Fit material that you are probably already familiar with. 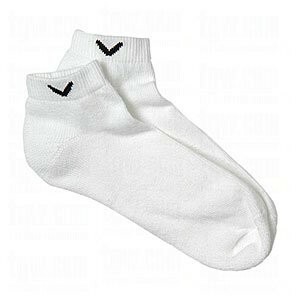 These socks also wick moisture from your feet, but are the "No-Show" style for you more subtle golf "fashion-istas."